What is the Vantrix Media Platform? Vantrix Media Platform (VMP) is a software-defined solution that enables video service providers to cost-effectively deliver high-quality multi screen video. This modular platform includes video processing, bandwidth optimization, caching and analytics. VMP modules can be deployed as Virtual Network Functions on ultra-high-density turnkey video processing appliances, or on standard servers in private or public cloud scenarios. Vantrix Media Platform is a modular, software-defined media processing platform that fits in with your current workflows and gives you the flexibility you need to quickly adapt to changing consumer demands, business models and technology. Get up to 20X more streams per RU and reduce costs by up to 80%. Vantrix Video Processing components deployed on a 1, 2 or 4.3RU COTS turnkey hardware can reduce footprint by up to 95%, thanks to the unique way they tap into the power of the GPU via software. Virtualization using OpenStack cloud platform technology enables Vantrix Media Platform components to run as Virtual Network Functions, on premise in a private cloud using video-optimized appliances or standard servers, or in the public cloud for maximum scalability and elasticity. 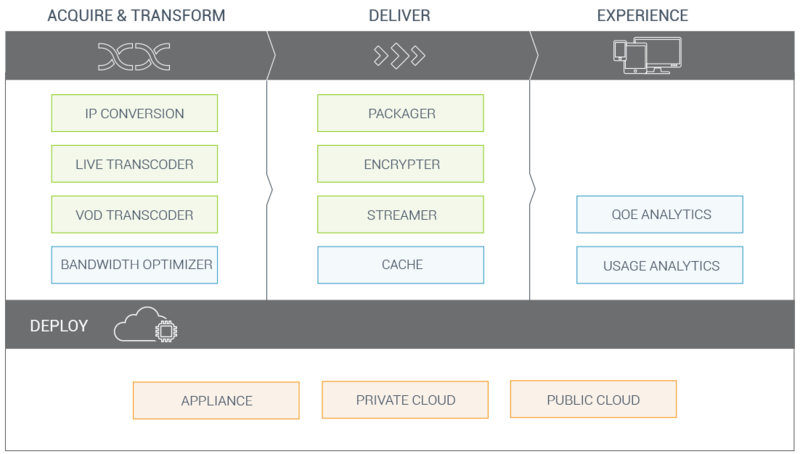 This flexible architecture aligns with the strategic trend towards Software Defined Networking (SDN). What does Vantrix Media Platform include? Vantrix Media Platform has a modular architecture to give you maximum flexibility. Choose a pre-defined Vantrix solution, which includes a bundle of modules, or select just the modules you need for your workflow. The Acquisition module allows the ingestion of live feeds and VOD content. The Live Transcoder module allows transcoding of live feeds and produces single or multiple output rates. The VOD Transcoder module allows transcoding of VOD content and produces single or multiple output rates. The Bandwidth Optimizer module provides advanced mobile bandwidth optimization to improve QoE while efficiently managing network resources. The Packager module provides ABR packaging. The Encrypter module provides DRM encrypting. The Streamer module provides streaming. The Cache module provides advanced smart caching to improve QoE while efficiently managing network resources. The QoE Analytics module provides advanced QoE monitoring and measurements to efficiently manage the user experience. The Usage Analytics module provides advanced KPI measurement to improve QoE while efficiently managing network resources. Learn more about Vantrix Media Platform’s virtualized architecture and how it can be deployed on turnkey appliances or standard servers in private or public cloud scenarios. Read this informative e-book to learn about the must-have technologies for profitable multi screen video processing and delivery.